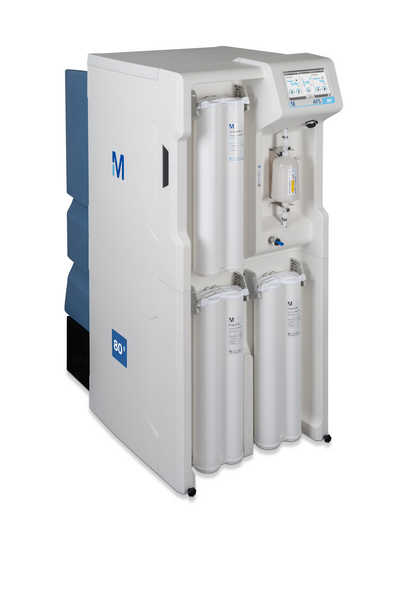 AFS® E Analyzer Feed Systems provide an economical and reliable high-performance water purification solution for daily water needs of up to 3000 L. They integrate the state-of-the-art Elix® electrodeionization (EDI) module, as well as 24/7 real-time monitoring and remote control. Water produced by the AFS® E systems complies with the Clinical and Laboratory Standards Institute® (CLSI) guideline for clinical laboratory reagent water (CLRW). With 24/7 full monitoring capabilities and automatic e-record archiving for up to two years, AFS® E system traceability facilitates laboratory accreditation and reaccreditation processes. Systems benefit from an unprecedented level of service (pre-installation water analysis, customizable Watercare Pact plans, and remote connection capabilities), helping you maximize performance and reliability for your system. The systems’ patented Elix® EDI technology, which uses ion exchange resins that are permanently self-regenerated, is combined with other complementary water purification techniques to ensure constant water quality with low and predictable running costs. Unique E.R.A.™ technology automatically optimizes water recovery based on feed water quality to decrease water usage costs. With their user-friendly large color touch screen and intuitive dashboard, AFS® E systems display all important information about system operation at a glance, saving users time and effort. Systems are designed for minimal upkeep: the touch screen shows step-by-step instructions to allow fast and easy maintenance. RFID technology ensures automatic traceability for consumables, and bactericidal UV lamps reduce AFS® E and analyzer sanitization needs to maximize analyzer uptime. AFS® E systems are compact and mounted on wheels, so that they can be installed wherever it is convenient in the laboratory. Systems are also customizable, allowing you to adapt them to your specific requirements (for example, by adding a TOC monitor). For full confidence in your AFS® E system, it is delivered with a Certificate of Calibration for the built-in temperature and resistivity meters, and a Certificate of Conformity ensuring that it has been built and tested fully assembled following internal Standard Operating Procedures. The manufacturing site is ISO® 9001 v.2000 and ISO® 140001 certified.